The Short Brothers (sometimes shortened to “Shorts”) concern was formed in 1908 with operations settled out of London (having since moved to Belfast, Ireland). The company made a name for itself in World War 1 as a manufacturer of floatplane aircraft and airships. Throughout the 1920s and 1930s, they became renowned for their series of flying boats that saw extensive service throughout World War 2 and in the subsequent Cold War. The Short concern continues operations today despite its sale to Bombardier in 1989 as a manufacturer of aircraft, aviation parts and systems. With this long-running, storied history in place, Short developed the Short 330 in the early 1970s, the type eventually adopted into civilian service beginning in 1976. The 330 was a further evolution of the SC.7 Skyvan though given a lengthened fuselage and larger dimensions overall. Originally known under the SD3-30 designation, the 330 was marketed as a low maintenance product and retained the former’s high-mounted wings, deep slab-sided fuselage and noticeably raised empennage. The aircraft were developed as rather compact, transport-minded, twin-engined airframes with good Short Take-Off and Landing (STOL) characteristics, allowing it to operate from shorter airfields than other aircraft of this class. The first 330 went airborne on August 22nd, 1974. The United States Air Force took note of the type and placed an order for eighteen units in March of 1983 as part of Military Airlift Command (MAC), intended to serve primarily across American bases in Europe. 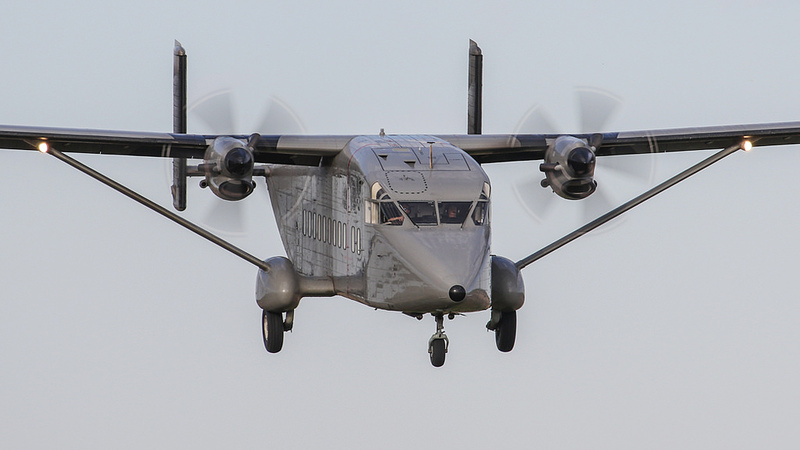 The models were designated as C-23A “Sherpa” and did not feature fuselage windows while also being outfitted with a conveyor system and hydraulically-powered rear loading doors as well as a portside loading door. This variant of the Sherpa is powered by 2 x Pratt & Whitney Canada PT6A-45-R series turboprop engines, each delivering 1,200 horsepower for a maximum listed speed of 280 miles per hour and a listed cruise speed of 255 miles per hour. Operational range is approximately 770 miles with a service ceiling of 27,000 feet. The first C-23A began operational service with the USAF in 1985. USAF Sherpas operated until 1990.